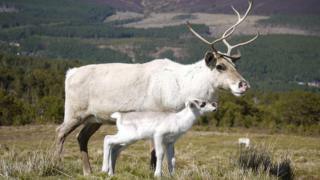 A new study is to examine the behaviour of Britain's only free-roaming reindeer herd. Scientists are to investigate the ecological role the animals play in the Cairngorms, where the herd has been since 1952. GPS collars equipped with cameras will be fitted to some of the reindeer to track their movements. Samples of the animals' dung will also be analysed by researchers at the Royal Botanic Gardens in Edinburgh to gain a better understanding of the animals' seasonal diet. Inverness College UHI, part of the University of the Highlands and Islands, will lead the Cairngorms Reindeer Research Programme. It will work with other organisations in the study, including the Reindeer Company which owns the reindeer herd. Dr Louise de Raad, Inverness College UHI research fellow and principal investigator said: "The Cairngorms National Park contains some of the finest forests and mountain habitats in Britain and the park authority is seeking to maximise the restoration and expansion of these areas. "We know the reindeer are a key visitor attraction, but despite being present for more than 60 years we know very little about their impact on the area. "Studying their feeding and ranging behaviour will be a first step towards understanding their impact and this will help us make recommendations to ensure that the herd is managed sustainably and continues to make a positive contribution to the area."